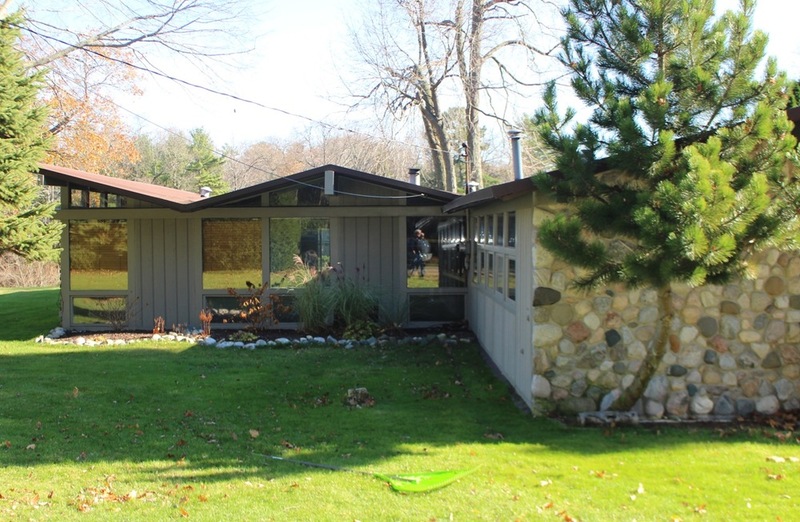 When Stephon VanderWater bought the O'Ryan home in 2012 in Norton Shores in Muskegon County it was his first modern-style home. 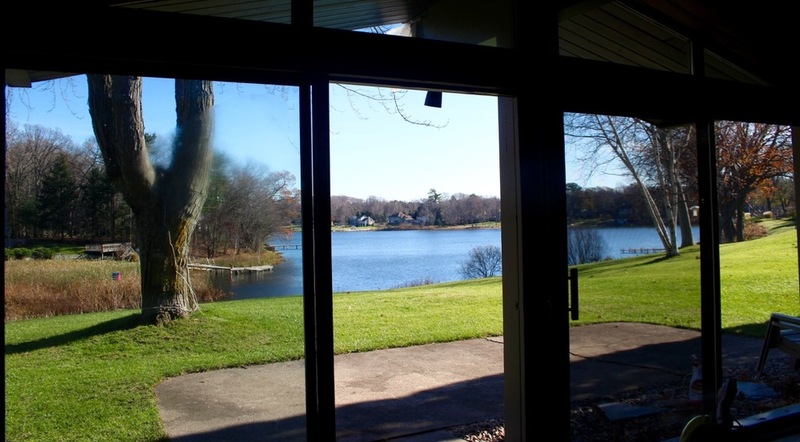 The house came with 200 feet of Mona Lake frontage and is a great place to launch kayaks and paddle to Lake Michigan. Stephon welcomed our interest when we knocked on his door in November, 2015 and took us on a tour. We visited the home in both November and December. The O'Ryan house came to be when the original owner O'Ryan met architect E. John Knapp at a lecture Knapp gave for the Muskegon Garden Club. 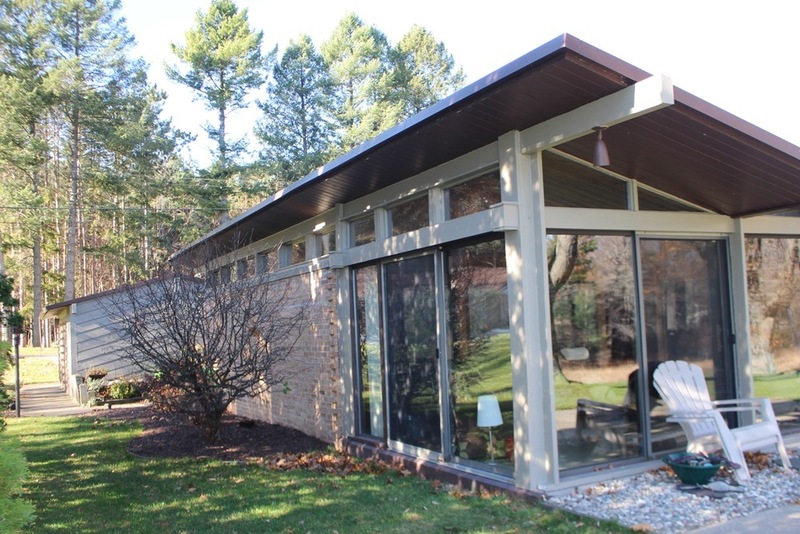 The topic of the lecture was the relationship of architecture and landscaping and the speech was later published in the Michigan Society of Architect's monthly publication. Stephon calls it the perfect home — right-sized with a distinctive architectural style. Completed in 1957, the home's all-season views are spectacular. During winter Stephon says it's like living inside a snow globe. Expansive glass window walls frame the living room, dining area and master bedroom. The large wooden frames appear to have been custom made on site and are original to the house. The unusual folded plate roof with deep eves creates the interesting interior angles of the vaulted ceiling. Exposed structural beams pierce the glass. The wood is still beautiful and the visible structure of the home is its greatest decorative feature. 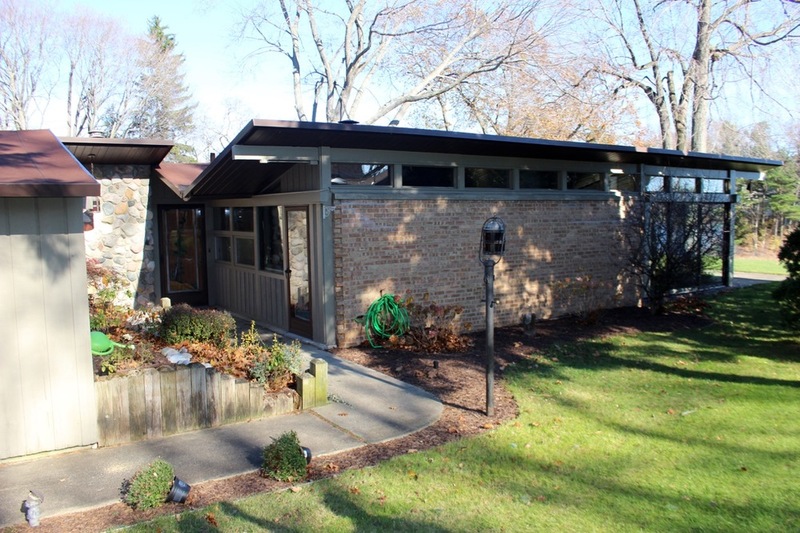 The designers of the mid-century worked with combinations of natural materials like wood, stone, brick, glass and cement, and they felt that this minimized the need for add-on decoration. A porch extends along the entire width of the house with outdoor access from original sliding glass doors in the living room and master bedroom. 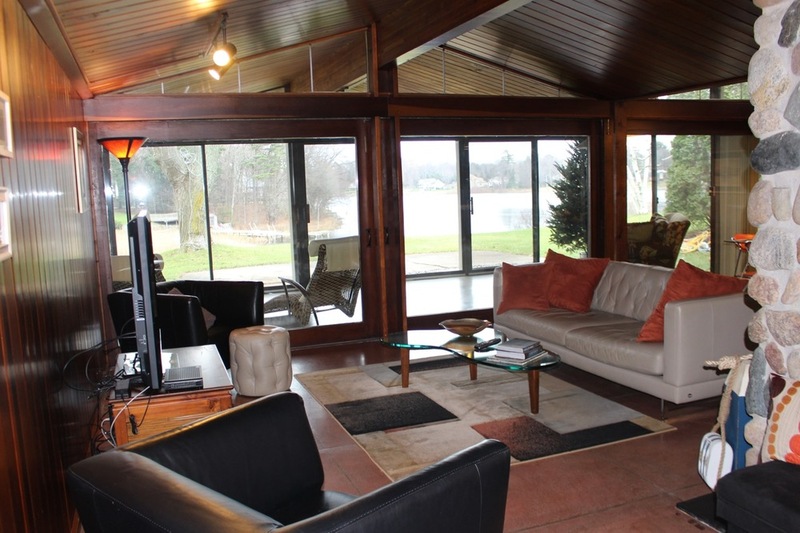 The porch is really extraordinary - a large outdoor living room with panoramic views of Mona Lake. Stephon wants to preserve the period-consistent wood paneled walls that are still in great condition. The large stone fireplace has a strong vertical pull and adds a friendly cottage look. The exterior brick walls are exposed on the interior in the dining room as well as the master bedroom. The rosy brick is topped with a horizontal band of clerestory windows in both the dining room and bedroom. Step through the bedroom sliding glass doors and you are on the porch in a great space set up with table and chairs for "outdoor" dining or just sipping coffee with your morning paper. Stephon bought the house at what one would consider a significant bargain especially considering the unique design and lakeside location. The house is of an age when significant repairs would be expected, so Stephon weighs the must-do's and the fun want-to-do's on his punch list. Sometimes the choice is made for him. He discovered the house was not grounded when lightning struck between his house and the house next door, sending the current through the ground and blowing out the lights in his house. On my second visit, a workman was outside on a ladder repairing one of the structural beams. With regard to design renovations, scored and polished concrete floors were revealed in the main living areas, hallways and bedroom when the carpet was removed. Stephon hopes someday to restored them. Meanwhile upgrades are in process. A new bathroom lightens the space. It is located at the very end of the wood paneled hall lined with built-in shelves. In the laundry room, Stephon painted the louvered doors a warm red that is a nice contrast to the tile floor in the bright white space and adds a touch of Feng shui. The galley kitchen works well for entertaining and has outdoor views of the exterior facade, the entry to the home and the exterior side of the massive stone fireplace. There are interesting views from every room of this unique home. Owning a iconic home like this is both an opportunity and a challenge. Stephen has embraced the challenge. It is clear he enjoys his unique Mona Lake home. He shared with us that although he at one point entertained the possibility of adding a second story, now, he is committed to preserving the architectural integrity of the house. Previous owners have passed along the original blueprints and these can guide renovations and provide an ongoing look at the architect's vision. It was so fun to tell him that the architect of his Mona Lake home E. John Knapp is alive and at age 99 still a creative force! We asked Knapp's daughter Marcia to ask John what he remembered about designing the O'Ryan house. Keep reading to find out what Knapp has to say about designing the O'Ryan House. According to Knapp, "O'Ryan was a landscaper. He approached me and asked me if I understood Japanese architecture. He had heard my landscaping speech [given in Muskegon].”"I told him, yes! I had studied Japanese architecture and I would love to build a house based on those principles. I asked him if he understood the tatami mat principle. He said he was aware of it but didn't understand it. I explained it to him. Their sizing of rooms was based on the number tatami mats it was, whereas American homes are always based on feet and inches. I adapted the tatami mat principle to modules.